The Black Lives Matter movement sprung from a perception that police officers display racial bias. It would be reasonable to ask if that perception is true. This paper explores racial differences in police use of force. 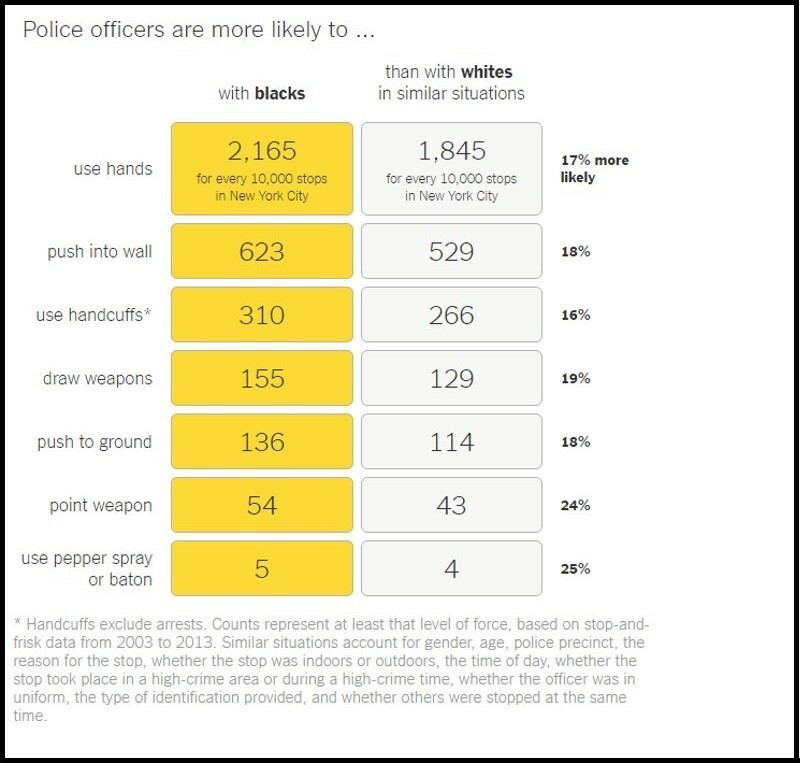 On non-lethal uses of force, blacks and Hispanics are more than fifty percent more likely to experience some form of force in interactions with police. Adding controls that account for important context and civilian behavior reduces, but cannot fully explain, these disparities. Here is a chart that the New York Times uses to explain the study’s results. 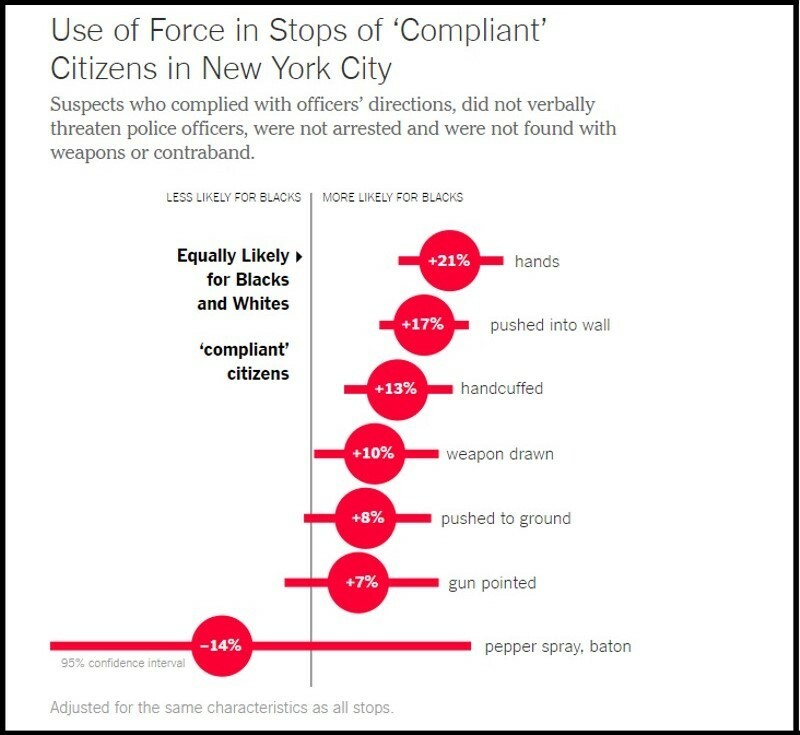 Lest someone think that only non-compliant citizens get roughed up by the police, here is another chart revealing the study’s results. That police officers might use excessive force is a fact acknowledged by public officials. Earlier this year, former Tulsa County reserve deputy Robert Bates was convicted of manslaughter. The jury in his case decided that Bates didn’t have an excuse for shooting a black suspect after the latter was face-down on the ground and subdued by other law officers. So, black Americans shouldn’t be ignored or dismissed when they complain about bias from police officers. On the other hand, black Americans shouldn’t immediately suspect racism whenever a non-black police officer shoots a black person. The study that the NYT refers to is the same study authored by Harvard economist Roland G. Fryer, Jr. The first half of the study’s abstract is quoted above. Here is the second half. On the most extreme use of force – officer involved shootings – we find no racial differences in either the raw data or when contextual factors are taken into account. We argue that the patterns in the data are consistent with a model in which police officers are utility maximizers, a fraction of which have a preference for discrimination, who incur relatively high expected costs of officer-involved shootings. “The importance of our results for racial inequality in America is unclear. It is plausible that racial differences in lower level uses of force are simply a distraction and movements such as Black Lives Matter should seek solutions within their own communities rather than changing the behaviors of police and other external forces. “Black dignity matters”, says Fryer. Actually, human dignity matters regardless of a person’s race. Racists can be black, too.